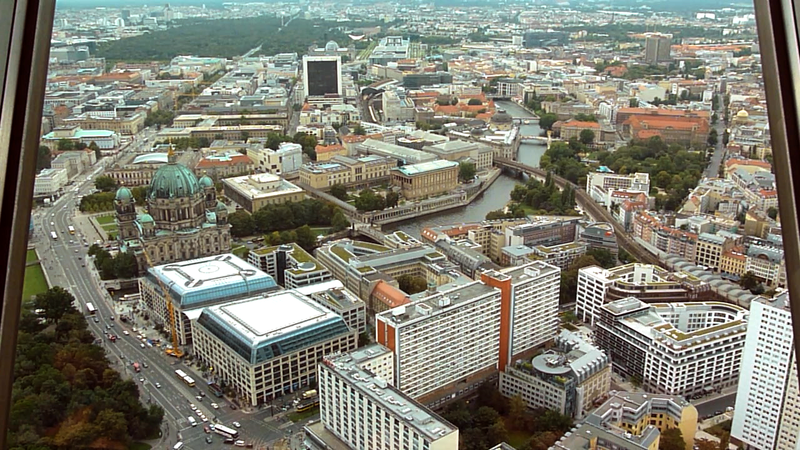 From the TV Tower (Fernsehturm) at Alexanderplatz you get a 360 degree birds-eye-view of the entire city of Berlin! 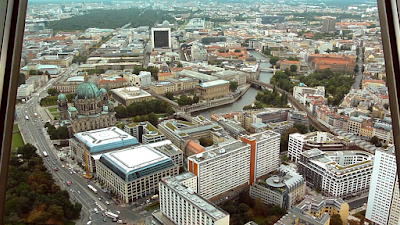 I have saved this trip and video for the grande finale of my 70 week long series of weekly 1-minute In A Berlin Minute videos from Berlin (and a few other side excursions). Scott and I took the elevator up 200 meters to the viewing floor of the 4th tallest free-standing structure in Europe on Monday - less than 48 hours before leaving Berlin. The TV Tower originally opened in 1969 in what was then still East Berlin (and therefore part of the GDR aka East Germany). To see what the tower looks like from the ground, please check out my video "TV Tower - Fernsehturm" - In A Berlin Minute (Week 29). To give you the full effect of the 360 degree view, I filmed at every third window. The song is "The Fairest Wheel" by Jason Matherne of Goonygoogoo Productions. Alright then, as I've mentioned, this is a bit of a finale to my "In A Berlin Minute" weekly series, which I spontaneously started during my first week in Berlin, where I had moved to from New York in April 2010. I never expected to be making these videos for so long - and I wouldn't have done it without all of the amazing support from you viewers on YouTube, Vimeo, blip.tv, Facebook, Google Plus and iTunes. Or do you think I should just quit with this grande finale? I would love to see "In A Brooklyn Minute" (especially the extended versions!) while you are there and I would be happy if you would just continue producing the Berlin minute (especially the extended versions! :D) when you're back. Why not keep the title? I don't see the problem, especially if there's no big concept change. Have a good time in Brooklyn :). What are you going to do there? Ach ja: Schön dass du deine Angst, hoch zu gehen, überwunden hast :-). War doch ein schöner Abschluss. Ich wäre auch gern hoch gegangen als ich letztens in Berlin war, allerdings war der Eintritt gepaart mit 1,5 Stunden Wartezeit dann doch zu viel des Guten. Jedenfalls freue ich mich darüber, wie viel ich schon auf den Luftbildern erkenne (und natürlich dass du sie mir ermöglicht hast). Very cool! Plus I'm due to be stuck in the house working while Zo takes her family up the tower, so this way...I don't miss out? Love to see more of Brooklyn - get filming! Teuer ist der Fernsehturm, aber das Warten war total okay, da man per SMS benachrichtigt wird, wann man dran ist. In der Zeit war ich einkaufen. Seems like our timing was right on again. Thank you also for your encouragement. It would be fun to film around Brooklyn and imagine you and Zoe watching. Thank you for watching my videos whenever you can and for your great title suggestions. By now I've officially decided that I'd continue under the title "In A Bklyn Minute". I hope you'll keep watching. Btw, I will change the comments to the Disqus system soon, so that commenting and responding works better. But this will mean all previous comments will be deleted.